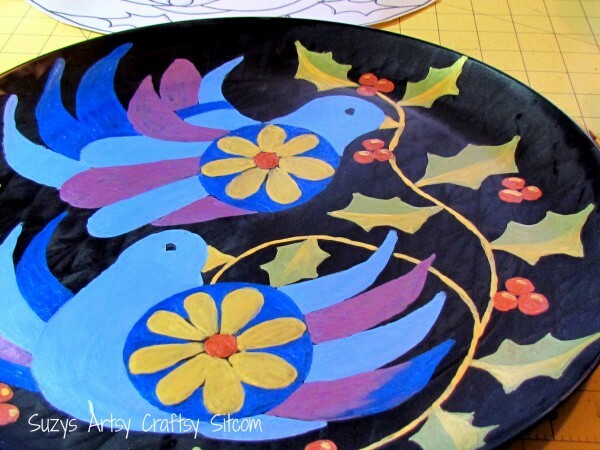 Free Two Turtle Doves Pattern! I have always loved the Christmas song, “The Twelve Days of Christmas“. So, I have been gradually putting together patterns that depict each of the days in the song. So far, we have Partridge & Pear. And now, I am introducing Two Turtle Doves! I am offering this holiday pattern free of charge to my readers. 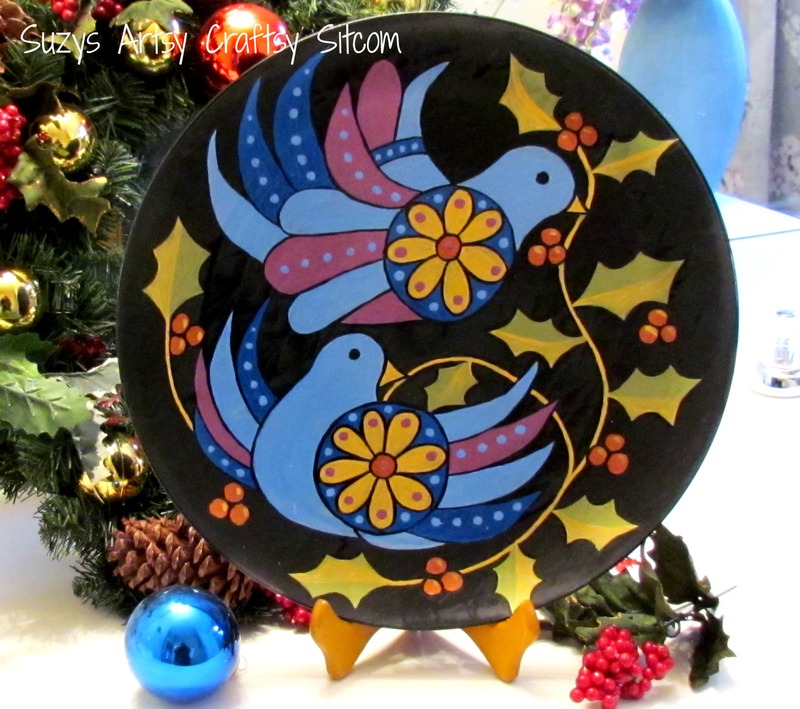 I created a unique, hand painted Christmas plate using the Two Turtle Doves pattern. Note: Some of the links below are affiliate links. That means if you happen to buy something, a small percentage of that sale goes back into this site, which enables me to continue to bring you free tutorials such as this one. So, thanks! 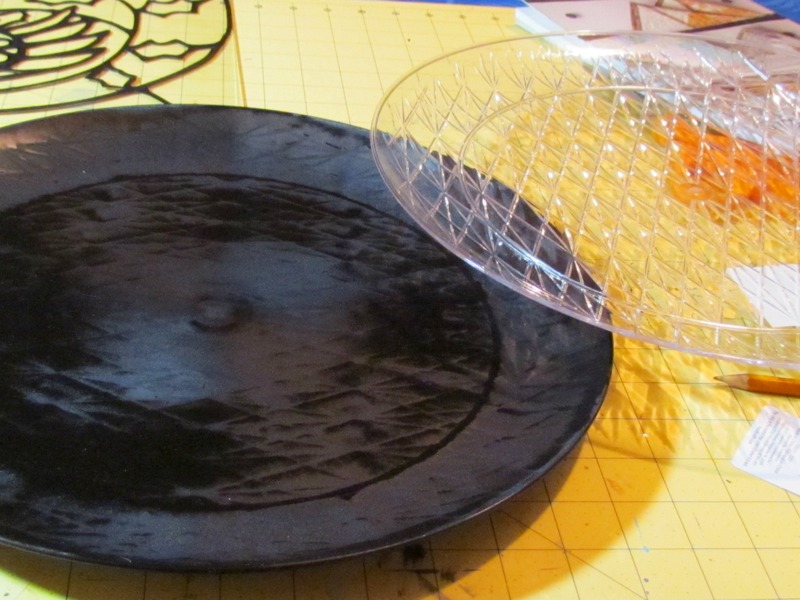 Spray the platter with the black primer on front and back. Print out your pattern and enlarge it to the size that you would like. Coat the back of the pattern with a layer of chalk, lay it over your plate, right side up, and use a pencil to draw on the lines of the pattern, transferring it onto the plate. It will look a little messy, but it will be enough to see the basic lines. Outline the lines with a white pencil to make it easier to see the areas that will be painted. Use the metallic acrylic paints to fill in areas of color. It will take a couple of coats of paint to get a good strong hue. 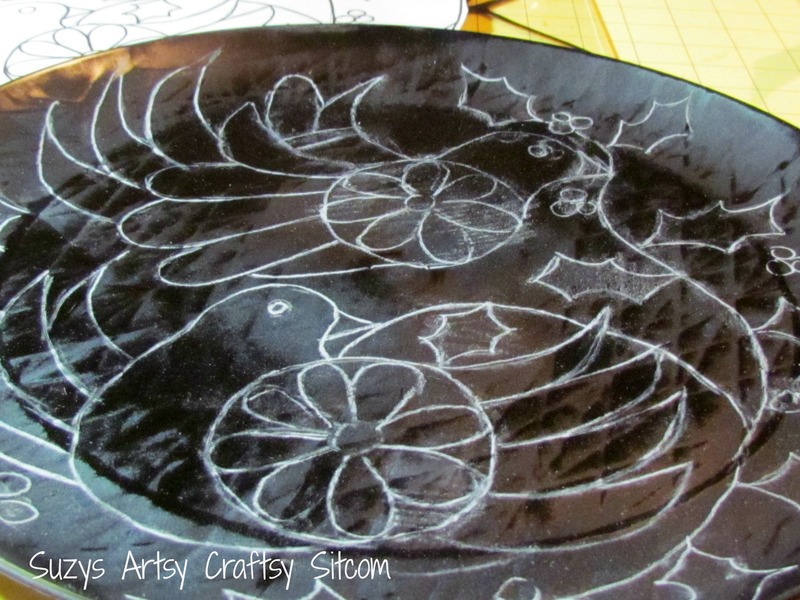 Outline with black metallic acrylic paint. 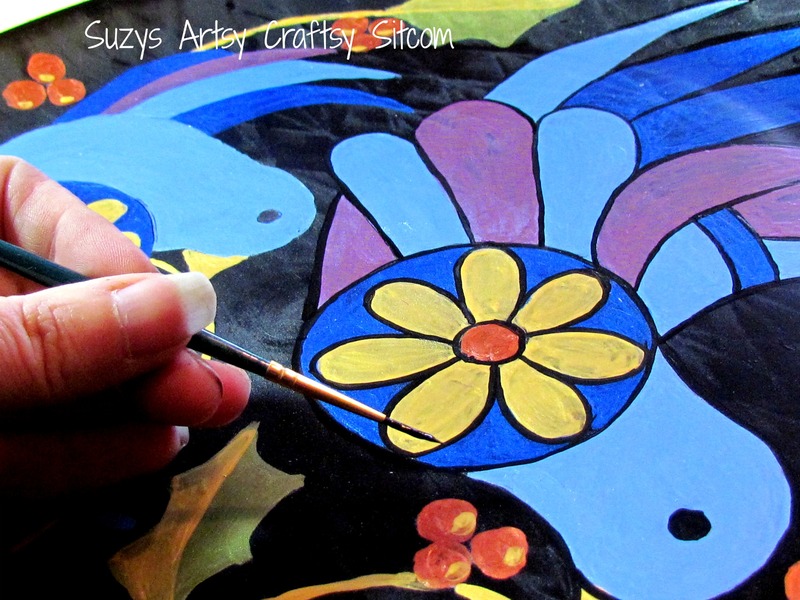 Add details of contrasting dots. 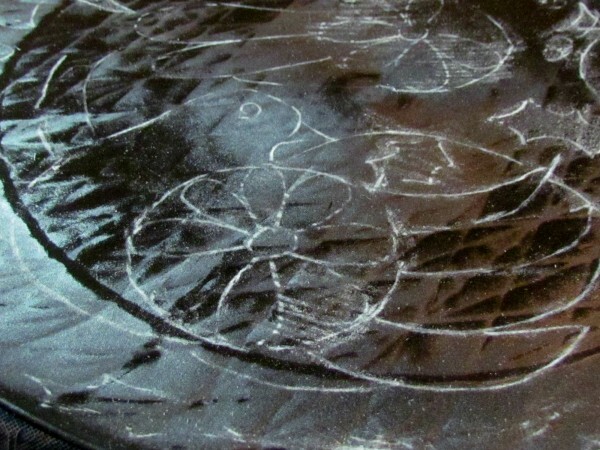 Finish the project with a protective coating of Clear Acrylic Spray. 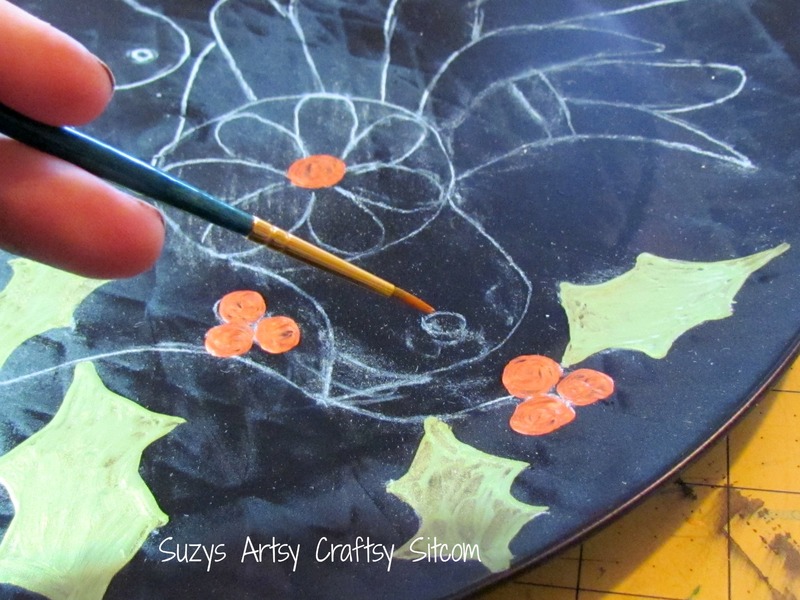 And there you have it, a beautiful Christmas decorative plate for the holidays! NOTE: This plate is not meant for food contact, it is for decoration only. This free pattern can be used with lots of techniques! 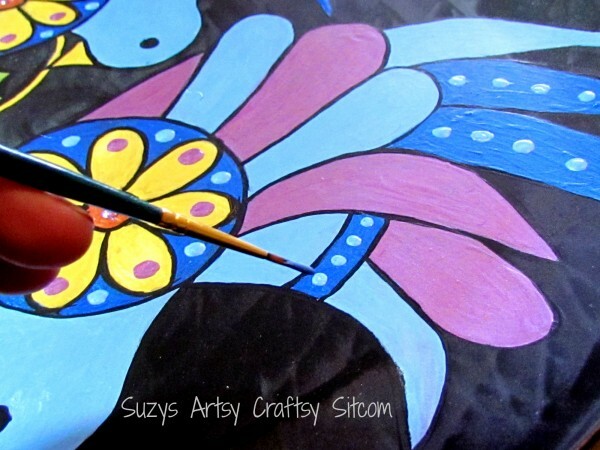 Check out these tutorials for some other great ideas: Crayon Batik, Applique, Faux Punched Tin, Mosaic, Cut Paper Art, Embossed Aluminum, and of course, Faux Stained Glass. 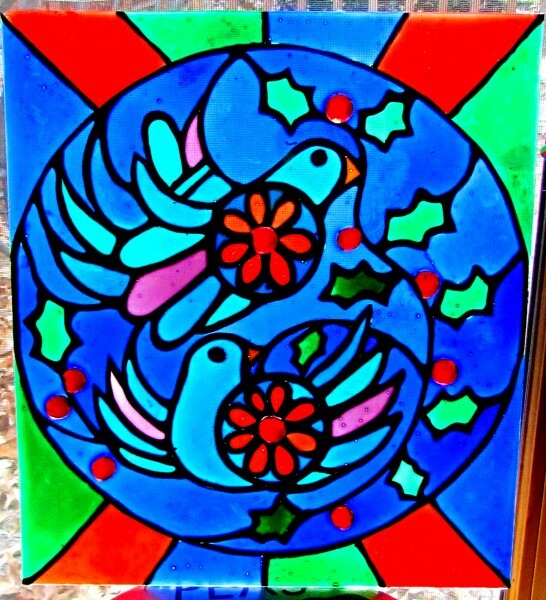 Want to see it in Faux Stained Glass? I added little glass cabochons that I found at Walmart for the berries and the center of the flowers. The sun shines through them wonderfully! Be sure to visit my Free Pattern Page! For more Christmas craft ideas, see my Christmas Crafts Page.